THE SURF HOUSE OVERLOOKING MUSKEGON LAKE BY CARL ZILLMER, AIA, OBRYON & KNAPP. Text and photos by Pam VanderPloeg copyright 2015, West Michigan Modern. With summer around the corner, it’s time to think about warm sunshine, Lake Michigan breezes, sand dunes and beach houses. This late 1950’s Muskegon home was designed to take maximum advantage of sunlight and lake views in true California Contemporary style. I’m calling it the Surf House because the owners make a surfing pilgrimage to Costa Rica every winter, and years ago, owned a surf shop in Muskegon. The home is located in Muskegon’s Bluffton neighborhood near Muskegon Lake and Pere Marquette State Park on Lake Michigan. Driving up to the Surf House for the first time felt like stumbling upon a lovely driftwood sculpture with its weathered board and batten siding. 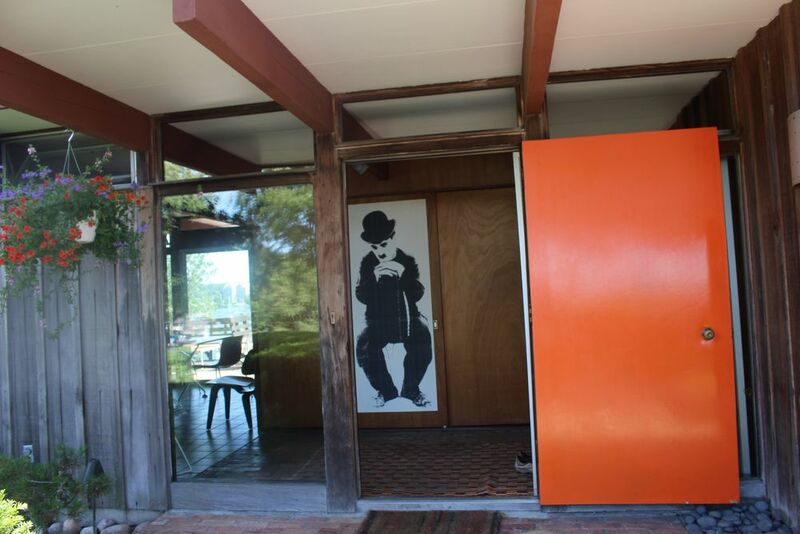 As you approach the front door of the Surf House you are greeted by a large Charlie Chaplin print visible in the foyer beyond the bright orange door. This is a theatre rich area and Larry shared some of the local Buster Keaton lore with us as we entered the main living space of the house. The Bluffton neighborhoodwas the summer home for actor Buster Keaton’s family. The area was home to a Pigeon Hill, a large dune gone today due to sand mining for industrial uses from the 1930’s on. This dune was a landmark and the summer backdrop for Buster Keaton’s family performers at the Lake Michigan Park Theatre built in 1898 to compliment the beach pavilion owned by the Muskegon Traction and Lighting Company, the city’s trolley service. The Keatons returned annually, built a cottage and established an Actor’s Colony http://actorscolony.com/ that lasted until about 1938. Buster Keaton’s father at least once rode an elephant around the streets. Today the dune is gone, the theatre is gone but Pere Marquette Park is there for all to enjoy. The Surf House is built on an extraordinary site perfect for outdoor living with its generous deck and breathtaking view of Muskegon Lake clearly visible inside and out. Larry and Lynne can also enjoy a glass of wine and the Lake Michigan sunset from adirondack chairs on an unobtrusive deck nestled into the dunes on the other side of the house. Mid-century homes are often referred to as California contemporary and that was actually the inspiration. In the late 1950’s, the original owner, Larry’s uncle, moved back to Muskegon from the California coast and brought back with him his appreciation for the Eichler homes and a dream to recreate the style in West Michigan. Larry and Lynne bought the home from Larry’s uncle and made it their own. The Surf House has a classic combination of horizontal design and post and beam construction. The hopper windows shown here ventilate the living area with lake breezes. The Surf house, which would look just as comfortable on the Pacific Coast, has floor to ceiling windows guaranteed to make you forget you are actually inside in a room enclosed by walls. Dining and living come together here in this light filled space with amazing views during all four seasons. This is a good time to mention that the house has been beautifully and faithfully maintained. Improvements and renovations have been completed gently over the years in the spirit of the original design which can be challenging at times. When the house was built, in order to maximize the open space but keep it flexible, the architects implemented a unique solution. They created massive, decorative and utilitarian movable shelving units to allow for rearrangement of the main living area to suit the owners needs. The shelves can be used to define a more private setting as in the seating area shown here. From the vantage point of the original kitchen, you can see the harmony of the structure — beams, brick, and glass create a unified and pleasing image framed by the original wood cabinetry. The home has a convenient and efficient galley kitchen open on one side to the dining area and including a view of the lake to make it feel more expansive. The kitchen is original but for a few practical changes for example re-working the counter and cabinets to accommodate a new larger refrigerator. Past the kitchen and laundry room is the bedroom wing. In both bedrooms newer drawer units replace older built-ins and shoji screen doors are a good compliment to the beautifully maintained paneled walls and beams. Note the panels that pull out to expose fresh air vents. These are necessary as the windows with their scenic views do not open. The beautiful turquoise bathroom tile is also original. On our first visit, Larrydescribed his plan to refinish the beautiful decking. He had done a lot of research! On our second visit the deck planking had a beautiful new finish. On that visit as on the first visit Larry wanted to show us more area modern houses. In Muskegon you need a guide to find them because they are usually singletons in more traditional neighborhoods. He surprised us with an additional “tour” in his Lyman power boat on Muskegon and Bear Lake to see some beautiful homes that show their best sides to the water. On our first visit Larry brought out blueprints and that enabled us to identify both the Grand Rapids architectural firm of Obryon and Knapp and the design architect Carl Zillmer, an AIA architect working as an associate with the firm. Former partner with the firm, E. John Knapp remembered hiring Carl Zillmer after Knapp met him at the Grand Rapids Art Museum and discovered Zillmer was looking for work. Knapp invited Zillmer to come over to the office to meet the other partner OB (Obryon’s nickname). They hired him on the spot. Zillmer’s wife remembered driving to Muskegon so Carl could show her the house. And Zillmer’s son Eric, reminiscing about his father, recalled his image of his father, the architect, who was a vision of true classic mid-mod style: “gingham short sleeve button-front shirts, casual-dress slacks, and always a knit, square-end tie.” Carl Zillmer was the son of Grand Rapids architect Emil Zillmer who designed the International style home featured on West Michigan Modern in February 2015. http://westmichiganmodern.com/2015/01/26/international-style-house-designed-by-emil-zilmer-1937/. We looked at the original landscape plans drawn up for the Surf House conceived by Willard Gebhart. Gebbart also designed the Muskegon Causeway Memorial Park. He graduated from Cornell’s Architecture School and developed a national reputation with his designs for various Washington DC sites such as the British Embassy and the Folger Shakespeare Library and a number of private homes for governmental officials. Even with national success, Gebhart continued to live on his farm in Hart, Michigan about 35 miles north of Muskegon. We can’t express adequately our appreciation to Larry and Lynne for sharing the Surf House and guiding us through the neighborhoods. The close knit neighborhood is appropriately protective of the natural beauty of the area. There is an eclectic mix of homes in this area including some mid-century modern gems. In fact there are a significant number of beautiful midcentury modern homes in a variety of styles in Muskegon and they are well worth seeking out. Happy approaching summer to all!